(a) Remove the air cleaner filter element sub-assembly. (b) Visually check that there is no dirt, blockage, and/or damage to the air cleaner filter element. If there is any dirt or a blockage in the air cleaner filter element, clean it with compressed air. If any dirt or a blockage remains even after cleaning the air cleaner filter element with compressed air, replace it. (a) Remove the fan and generator V belt (See page ). (b) Check that nothing is caught in the tensioner by turning it clockwise and counterclockwise. (c) Install the fan and generator V belt (See page ). (a) Rev up the engine several times. Check that the engine does not emit unusual noises. If unusual noises occur, warm up the engine and idle it for over 30 minutes. Then perform the inspection above again. If any defects or problems are found during the inspection above, perform a lash adjuster inspection. (a) Warm up the engine and stop the engine. A warmed up engine should have an engine coolant temperature of over 85°C (185°F), and an engine oil temperature of 60°C (140°F), and the engine speed should be stabilized. (2) Start the engine and idle it. (4) Enter the following menus: Powertrain / Engine / Data List / Ignition Timing Cylinder #1. When checking the ignition timing, the transmission should be in neutral or park. (5) Check that the ignition timing advances immediately when the engine speed is increased. (6) Enter the following menus: Powertrain / Engine / Active Test / Activate the TC Terminal. (7) Monitor Ignition Timing Cylinder #1. (8) Perform the Active Test. (1) Remove the V-bank cover sub-assembly. (2) Connect the tester probe of a timing light to the wire of the ignition connector for No. 1 cylinder. Use a timing light which can detect the primary signal. 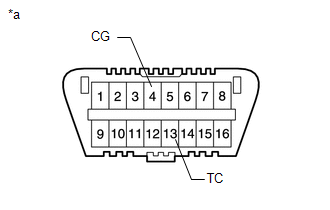 (3) Using SST, connect terminals 13 (TC) and 4 (CG) of the DLC3. Confirm the terminal numbers before connecting them. Connecting the wrong terminals can damage the engine. (4) Using a timing light, check the ignition timing. (5) Remove SST from the DLC3. (6) Check the ignition timing. (7) Check that the ignition timing advances immediately when the engine speed is increased. (8) Disconnect the timing light from the engine. (9) Install the V-bank cover sub-assembly. A warmed up engine should have an engine coolant temperature of over 85°C (185°F) and an engine oil temperature of 60°C (140°F), and the engine speed should be stabilized. Switch off all accessories and A/C before connecting the Techstream. (2) Race the engine at 2500 rpm for approx. 90 seconds. (4) Enter the following menus: powertrain / Engine / Data list / Engine Speed. When checking the idle speed, the transmission should be in neutral or park. (1) Using SST, connect the tachometer probe to terminal 9 (TAC) of the DLC3. (3) Check the idle speed. If the speed is not as specified, check the air intake system. (4) Disconnect the tachometer from the DLC3. After the inspection, clear the DTCs, check for DTCs again and make sure the normal system code is output. (b) Remove the intake air surge tank (See page ). 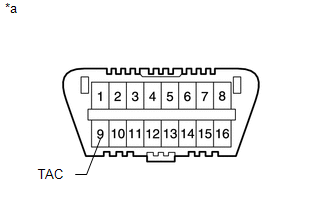 (c) Remove the 6 spark plugs (See page ). (d) Remove the engine room relay block cover. (e) Remove the EFI-MAIN No. 2 relay from the engine room relay block. (f) Insert a compression gauge into the spark plug hole. (g) Fully open the throttle. (h) While cranking the engine, measure the compression pressure. The measurement must be done as quickly as possible. Always use a fully charged battery to obtain an engine speed of 250 rpm or more. (i) Perform the inspection above for each cylinder. (j) If the cylinder compression in one or more cylinders is low, pour a small amount of engine oil into the cylinder through the spark plug hole. Then perform the first 3 steps under "inspect the cylinder compression pressure" for the cylinders with low compression. If adding oil helps boost the compression, it is likely that the piston rings and/or cylinder bore is worn or damaged. (k) Install the EFI-MAIN No. 2 relay to the engine room relay block. (l) Install the engine room relay block cover. (m) Install the 6 spark plugs (See page ). (n) Install the intake air surge tank (See page ). This is a check for determining whether or not the idle CO / HC complies with regulations. (b) Keep the engine speed at 2500 rpm for approx. 180 seconds. (c) Insert the CO / HC meter testing probe at least 40 cm (1.31 ft.) into the tailpipe during idling. (d) Immediately check the CO / HC concentration at idle and/or 2500 rpm. When performing the 2 mode (2500 rpm and idle) test, follow the measurement order prescribed by the applicable local regulations. If the CO / HC concentration does not comply with regulations, troubleshoot in the order given below. (1) Check the DTCs (See page ). (2) See the table below for possible causes, then inspect and correct the applicable causes if necessary.